Garden View, Lake View, Swimming Pool View. 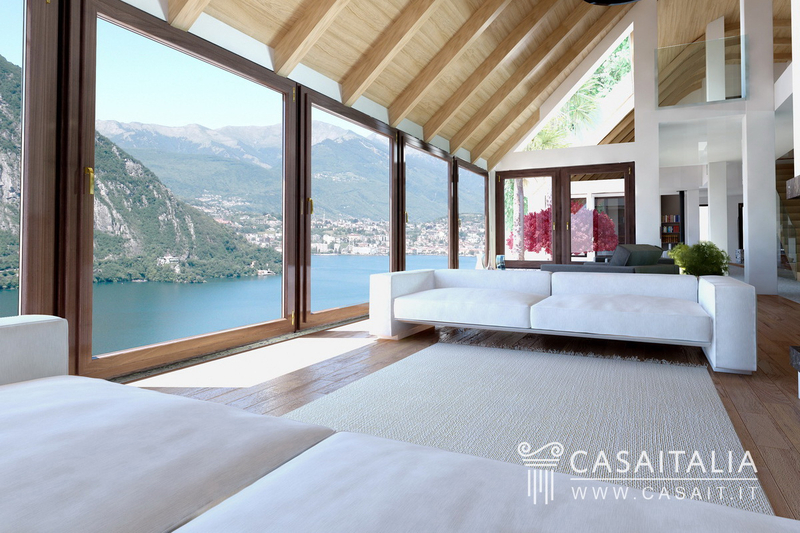 Villa on Lake Lugano is situated in a high-up location on the eastern shore of the lake. 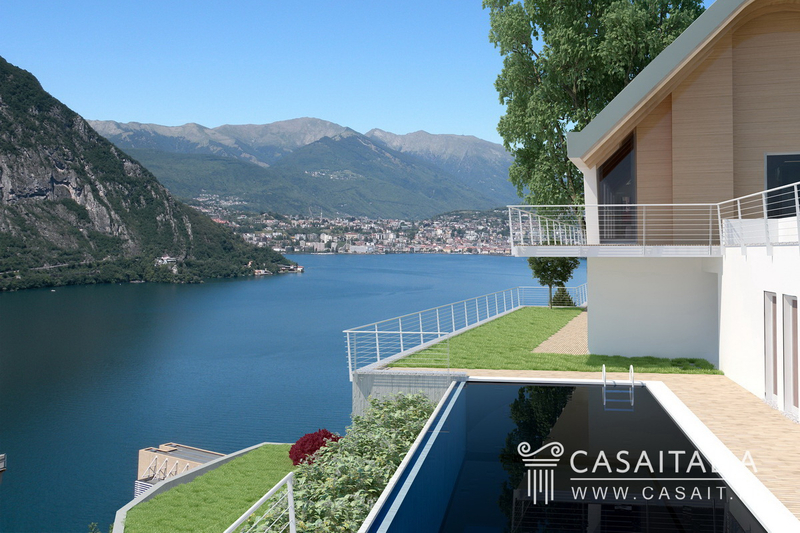 The building, still under construction, has a total surface area of 820 sq.m, and is one of the most impressive residences in the area, planned with maximum comfort in mind and with a stunning view of the lake. 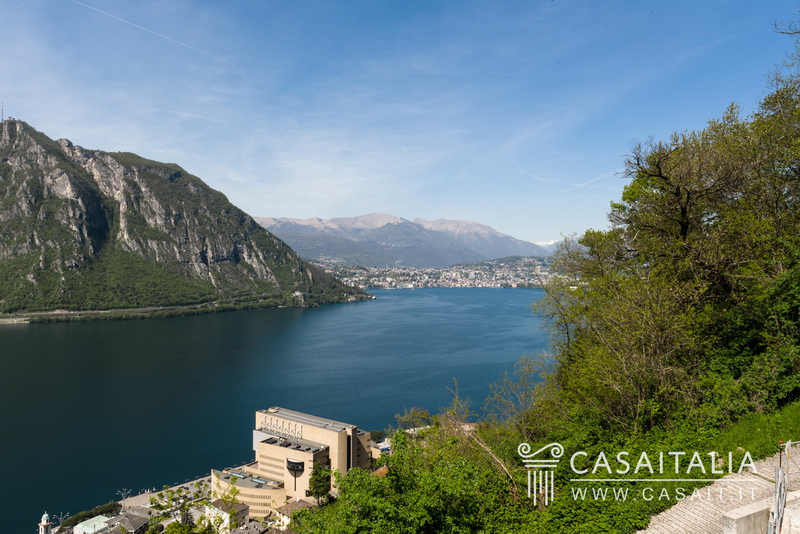 It is located in a residential area of the community of Campione d’Italia (only 2 km from the centre), an Italian enclave which is part of the province of Como, which is completely surrounded by Swiss territory. Thanks to many agreements with the Swiss government, both on tax and welfare, to live in Campione d’Italia is to be able to” live in Switzerland with Italian residency:” a not insignificant consideration for those wishing to live in a safe and accessible place in the centre of Europe and of Switzerland, with a temperate climate and favourable tax regime. Lugano (13km) with its restaurants, shops and casino can be reached in about 20 minutes by car. 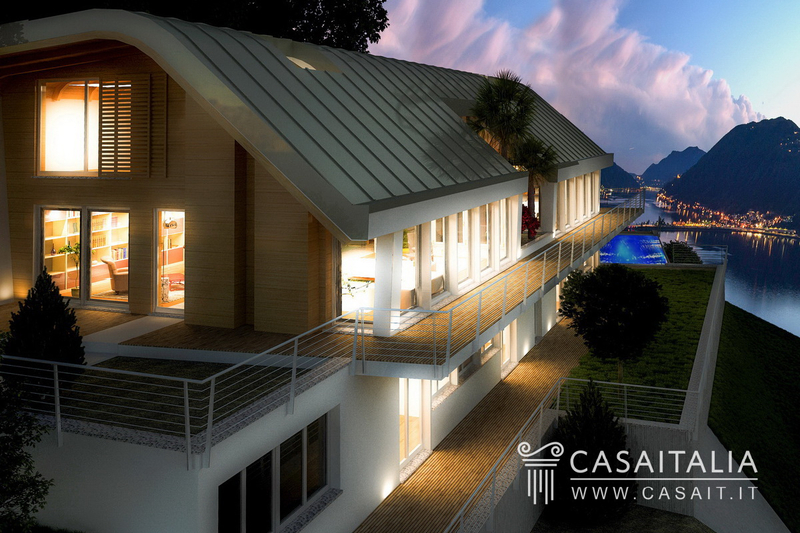 The property is also well connected with Como (35 km) and Milan (75 km) by the Swiss A2 motorway (4,5 km) which goes through the Brogeda valley to join with the A9 motorway in around 25 minutes by car (30 km). The nearest airports are Lugano, at 15 km (20 minutes by car) and the international hub at Malpensa (75 km) which can be reached in just under an hour by car. 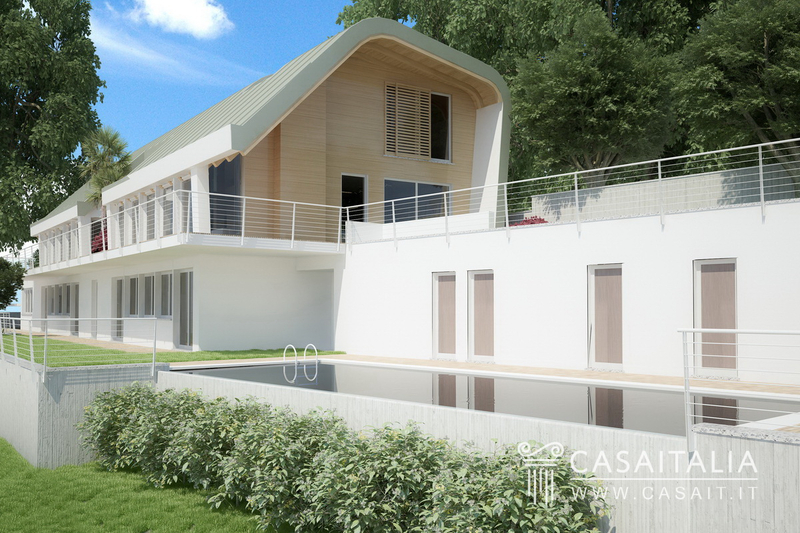 Description of buildings Villa on Lake Lugano is a property which has been planned and built to offer maximum comfort and usability, through its refined and contemporary design. The property is built on 3 floors: The main entrance opens onto the ground floor, where the project executive has visualised a studio (25 sq.m) and a large living room with glass partition (80 sq.m), split into two areas, separated by a pretty hanging garden, which also leads to the terrace with lake view which runs the whole length of the villa. 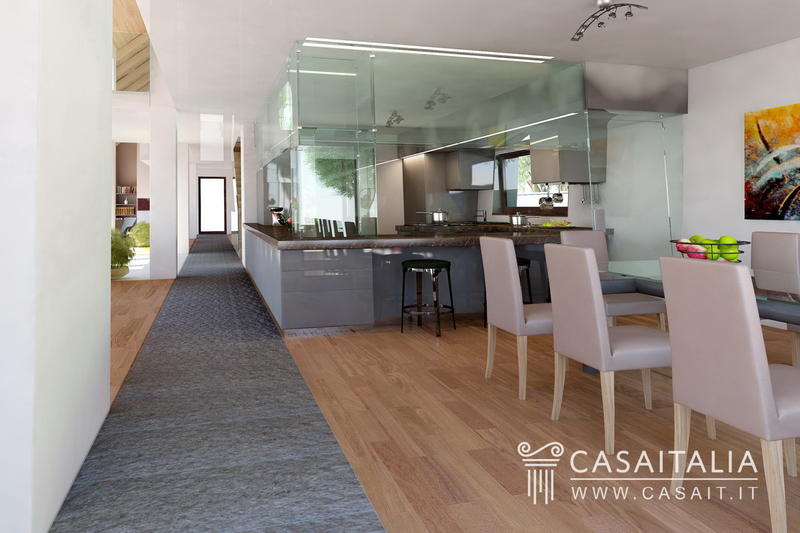 The hall, which goes through this area, connects with the dining area where there is space for the kitchen (20 sq.m) and the symmetrical dining room. From here, it is possible to go outdoors, via a portico, to the swimming pool area. The sleeping areas are separate: on the first floor there is the main sleeping area, with three bedrooms each with their own bathroom. The Master Bedroom offers a great, south-facing view of the lake, and in addition to the finishings of the other two rooms, also has a bathroom with tub as well as shower, and a large wardrobe. 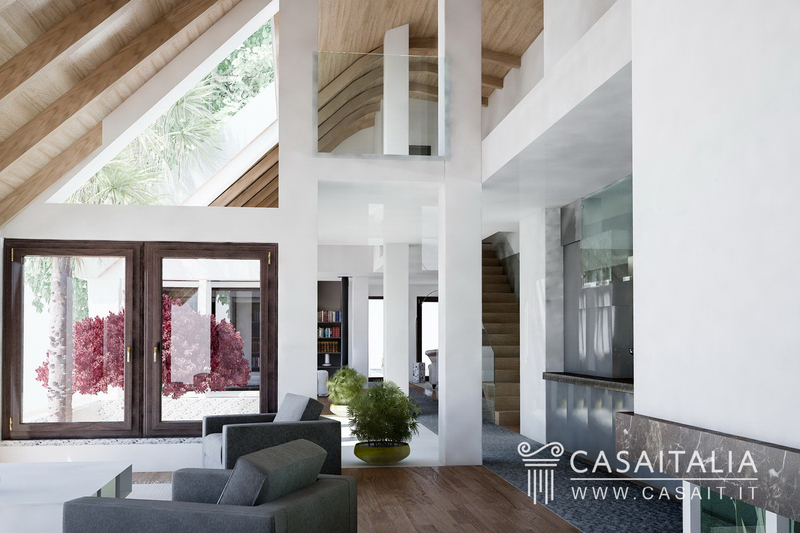 The first floor is a partial mezzanine and benefits from the light from the ground floor. Meanwhile, the guest sleeping area is on the basement floor and also opens onto the lake, accessible internally and externally. It comprises three double bedrooms, one of 21 sq.m with en-suite bathroom and two similar rooms with a shared bathroom. In addition, there are three other spaces and a bathroom on this level, potentially for use as a spa/wellness area. Finally, on the basement floor, there is an area intended for use as a concierge’s apartment, comprising one bedroom with bathroom and a pleasant living room/kitchen with separate entrance. From here, via a covered walkway, there is direct access to the swimming pool area, complete with bathroom and its own shower. 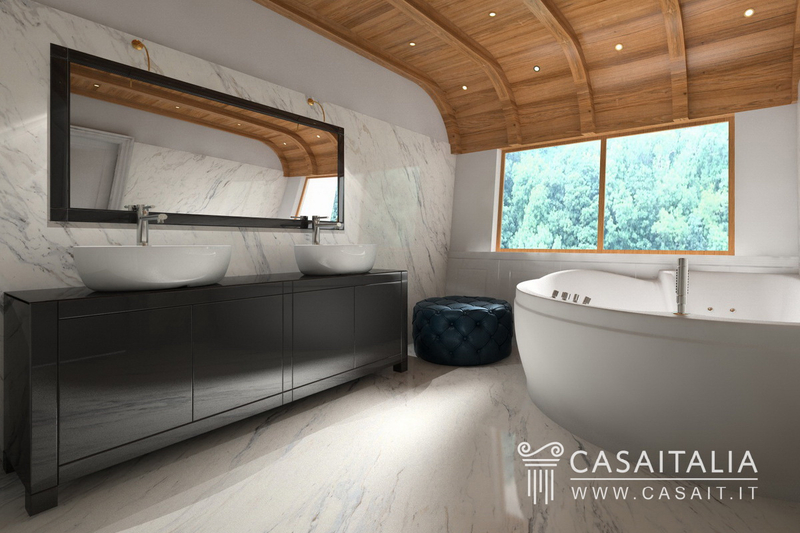 Finally, the sleeping area on the basement floor connects internally with the large garage of 57 sq.m and to the cellar and technical areas for the appliances. 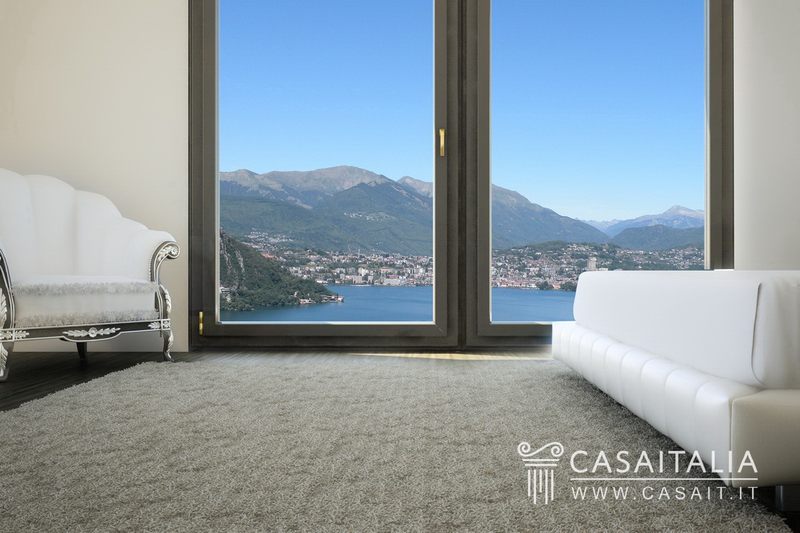 State and finishing All the finishings, which the potential buyer can select from a well-stocked catalogue, are of the highest quality: luxury wood flooring, marble/stone/ceramic bathroom fittings, natural stone and ceramic paving on the balconies, terraces, footpaths and surrounding the swimming pool. In addition, the judicious use of wood and steel, combined with innovative technology for the roofs and outdoor insulation provide an excellent, comfortable atmosphere. External areas The villa benefits from landscaped, sunny outdoor spaces, thanks to a design which maximises the potential of the site on which it is built. From the entrance to the underground garage, on the north side of the building, the garden stretches out in front of the villa, offering a beautiful view of the lake and the mountains, and runs the length of the perimeter to connect with the swimming pool area (12x4 metres in size), complete with bathroom and its own shower, plus a barbecue area. All the green spaces have been planted and arranged with indigenous plants. In addition, there is also a large terrace of around 40 sq.m, and two porticoed areas (each around 18 sq.m) close to the entrance and above the swimming pool, which also feature small hanging gardens, with grasses, flowers and shrubs. 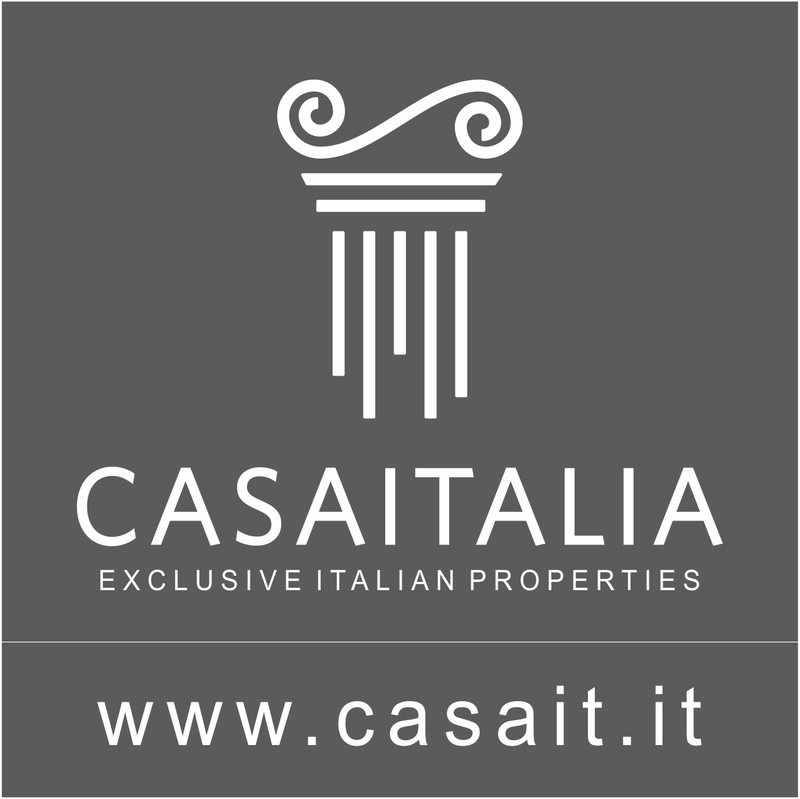 Use and potential uses The property is certainly one of the most prestigious residences on this side of the lake and would be perfect both as an impressive property and as a family home, with the opportunity to host friends and relatives. 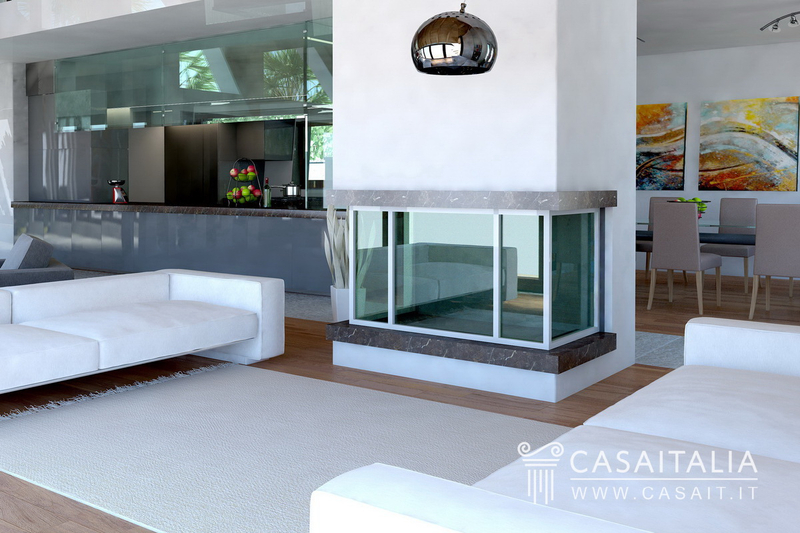 The current state of the property provides the potential buyer with the opportunity to make changes to the internal layout, adapting it to their own tastes and requirements.